I don't play many games on my iPad however the release of GTA 3 has got me hooked. I used to play this a few years back on my PS2 and PSP; so hearing it was now available for iOS, I just had to get it. The game plays amazingly well, the graphics are true to the original PS2 version; which in my opinion is some feat on a 9.7" handheld device. The key to the success with games like these on the iPad is the controls system. Rockstar appears to have this just right, even I can control things and that's saying something. All in all this game is streets ahead of anything else that I have played on my iPad, it is utterly brilliant! JJ Abrams is nothing short of brilliant. I love his movies and tv shows, and now his iPhone app - Action Movie FX. Meant to highlight the explosive effects used in his latest endeavor, Mission Impossible: Ghost Protocol, it gives you the ability to...well...blow things up. You can purchase two additional effects packages, one of which I got for $.99 that includes a fire (gun) fight and an air strike. If you ever wanted to direct expensive movies with huge special effects (or just wanted to blow things up), I highly recommend Action Movie FX. I'm not a huge fan of Christopher Nolan's Batman Begins and Dark Knight movies. He simply doesn't understand the core of the character (nor is he capable of producing good endings.) Bruce Wayne doesn't dress up as Batman. Batman isn't his secret identity. He is Batman. It's Bruce Wayne that he dresses up as; that's his secret identity. And it's his job to save everyone, from the citizens of Gotham to the Joker to Ras Al Ghul. It's his job to make sure no one ever dies the way his parents died, not ever again. It's those simple, essential truths that Frank Miller nailed so transformative-ly in Dark Knight Returns in the 1980s and Paul Dini and Bruce Timm realized perhaps best of all, detective and all, in Batman: The Animated in the 1990s, that Tim Burton touched on though ultimately stumbled all over in his attempt at the Batman franchise, and that Nolan missed completely, despite the great acting and production values of his soon-to-be completed trilogy. There's nothing wrong with Gotham that Batman can't fix with his brains and his fists. 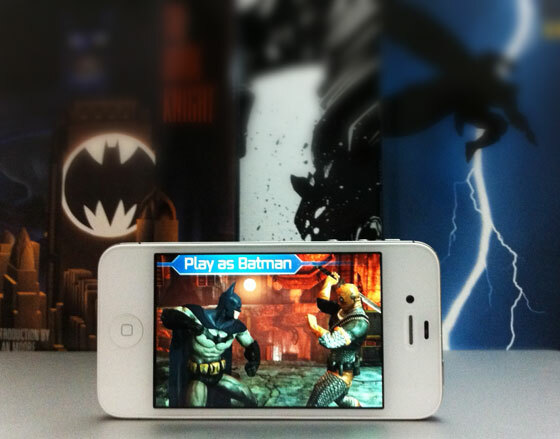 Which brings me, circuitously, to Batman: Arkham City Lockdown, the latest attempt to bring the Batman franchise to video games and the first to hit the iPhone and iPad. It looks great. It uses the same Epic Unreal 3 engine that powers Infinity Blade, and the designs are modern but true to the spirit of the characters involved. Control is good given the limitations of multitouch, and Batman: Arkham City Lockdown takes pains to walk you through them from the get go. Gameplay is a tad repetitive -- you go from area to fairly similar area and box your way from bad guy to fairly similar bad guy. Early hyper-swiping (is that the multitouch equivalent of button mashing?) quickly stops working, however, as badder guys require more precise counters and attacks, and you need to build your skills if you want to make it past anything other than the early stages. In general the Arkham series is an extreme take on the Batman -- hype-violent, with female characters whose, to quote Bill Watterson, powers seem to primarily consist of keeping their costumes from falling completely off. But it's well executed (no doubt thanks to having Paul Dini involved with the franchise), with good atmosphere, and has more than enough to please both longtime Batman fans and those who just want some gritty gaming fun over the holidays. It's retro day as we enter the last day of 2011. My choice for the pick of the week is Golden Axe, by Sega. This is an import of the classic arcade game from the late 1980's. You are a mighty adventurer, trying to save the King and his daughter from the evil Death Adder. Just like the arcade version, you can play as a Gilus Thunderhead, a dwarf; Tyrus Flare, an amazonian; or Ax Battler, a sword wielding barbarian. Pick up food and potions, ride dragons, and of course fight enemies along the way to the main battle to defeat Death Adder. Just like the arcade version, you can play mutliplayer here as well, using bluetooth. There are sequels (Golden Axe II and III) but this game is the real thing from the arcade. For anyone who played this game in the arcade, you MUST pick this game up asap and give it a try. The new version of Bejeweled adds not only more awesome graphics but new game play modes. I've always been hugely addicted to Bejeweled Blitz so I already knew this was a purchase I wasn't going to regret. The newer version has a Zen mode as well as a diamond mine mode. While one is timed and you have to attempt to blast away the earth and dig deeper, Zen mode is not timed and is just endless gameplay. If you're a Bejeweled fan, make sure you pick up the new version. I'm not much of a believer in the usefulness of New Year's Resolutions since many people make grandiose claims they'll never complete and end up feeling terrible about it, but if you make even one this January, make it to be more secure and efficient in your computing life and know outright that you can do it. 1Password is the key to unlocking success with this resolution. I chose it as one of my most-used apps of 2011 this past week (as did many of the TiPb staff), and I can't say enough about it. It is simply put, my single most valued application on both the Mac and iOS. We've talked about it at least a zillion times on TiPb, so I won't go into everything again. But understand this: I couldn't manage my life, our office, and the feeling of control over the myriad bits of information we all interact with on a daily basis without it. You might look at the prices of the apps and balk, but to me, there's no price I can put on either security or knowing that all the important data I need to access is always at my fingertips. You can always make more money, but you can't get more time, and an app this good is worth your time. Ok, I'll dial down the hyperbole now. But seriously, if you're not using it, why not? Don't you like making your life easier? Isn't it worth a few bucks to support fantastic software development and simplify things for yourself in the process? I think you know the answer to that. Go forth and learn a new way of living with your tech. Seriously. Go. Now. Doing a lot of holiday traveling, and want to make sure you arrive at your destination on time? Or maybe you're going out of town for the New Year, and want to make sure you don't get lost along the way? I've been using Navigon as my main GPS app all year, and then some. It's one of the best GPS navigation apps available for the iPhone and can even run on the iPad 3G. Navigon provides quick access to Google search, subsequently making it a breeze to search for your desired location (restaurant, gym, grocery store, gas station, whatever) and it also offers in-app purchases for things like 3D terrain mapping in a panoramic view, live traffic and even police radar location information. I'm sure some of you have personal prefecences for other GPS apps, or maybe even prefer a standalone device, but for me, Navigon does the job perfectly.